Trails.com - 1000's of Rides. Road and Mountain. Bicycle Texas -Texas Road Rides. The Independence Preservation Trust is developing a network of suggested bike routes in and around the Independence area. 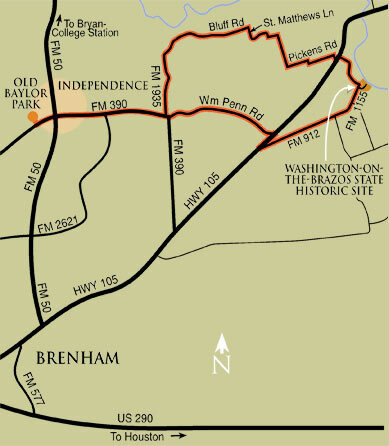 Below is "Independence to Washington-on-the-Brazos," our first route that takes you to two of Texas' most historic towns. 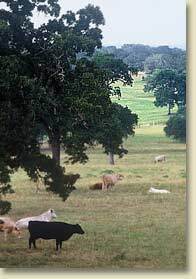 Description: For historic interests, long views of the Brazos River Valley and visits to country churches and general stores, this loop between Independence and Washington-on-the-Brazos State Park is a perfect way to experience the countryside of Washington County. Most of this ride is on paved, rural, back roads that will allow you to really see and appreciate the idyllic, country landscape around Independence. Roads: Rural roads are one lane. Please be alert because, while these rural roads are peaceful and do not have a great deal of traffic, most drivers are not accustomed to seeing bikers. These roads are paved but they are a little rough so, just in case, come prepared with a standard flat tire repair kit. FM roads are two lanes, no shoulders, light traffic except during spring wildflower season. Texas 105 has higher-speed traffic but does have a wide shoulder. Season: While this route’s rolling terrain and historic sites make it beautiful all year round, it is great for Texas wildflower viewing in the spring. Download PDF of this map for printing. 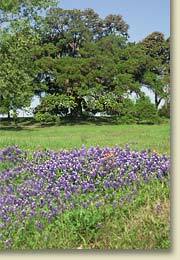 Two books and two websites provide excellent information on other bike tours through Washington County and Central Texas. White, Andy. Best Bike Rides in Texas. Old Saybrook, CT: The Globe Pequot Press, 1995. Ride 39: "Blue Bell Ramble"
Pellerin, Bill and Ralph Neidhardt. Bicycling the Houston Area. Houston, TX: Texas Bicycle Map Company, 1987. See historic sites in Independence on our detailed Independence Map. Cattle photo: Jeff Heger Photography. Other photos: Ellen Beasley. Research and content by Elizabeth Wolff Rogers.